Our foundation course in kids yoga teaching. This is a globally recognised professional qualification. On successful completion of the training you will be able to teach professionally in schools, preschools, nurseries and private venues. NB* The price is given in US dollars. This gets automatically converted by your bank to your local currency when you purchase. If you have any questions which aren’t answered here – about accreditation, eligibility, insurance or anything else – take a look at our FAQ pages! For full certification, you are invited to upload a video for feedback by me, using the class plan provided (Squish The Fish). I watch your video and give you supportive one to one feedback by video. If you hit the required standard, you get official certification from Cosmic Kids. You can use your certificate as evidence to insurance companies, schools and parents that you have the required skills to teach safe inspiring kids yoga. For more detail about certification, eligibility and insurance please take a look at our FAQ pages! With lifetime access you can work at your own pace – no deadlines! There is a total of six hours of material across 180 lectures in the course: including four hours of video lectures and a wide range of worksheets and quizzes. As a guide, you can expect it to take somewhere in the region of 20 to 30 hours of your time to do the learning, practice and appraisal process required to gain certification. Some students have done this in as little as 3 weeks. Others have spread the learning out over 6 months or more. You get lifetime access so you can do it at your own pace. We recommend you take your time – a few weeks at least – to absorb the learning and allow time to practice and enjoy it! If you are a registered adult yoga teacher with Yoga Alliance, these hours count as Continuing Education Hours. Every student becomes a member of the Cosmic Kids Campus, our lovely and supportive group of kids yoga teachers on Facebook. There are now more than 1200 of us helping each other on our kids yoga journeys. If you have any questions which aren’t answered here – about accreditation, eligibility, insurance or anything else – please take a look at our FAQ pages! We work hard to make this the best teacher training. It is completely brilliant – well-researched, brilliantly delivered and well-supported – even though we say it ourselves. However – if you are not satisfied with it for any reason, you can just tell us why within 30 days and we will give you a full refund. Wonderful course! The course is incredibly user-friendly, thorough, and perfectly paced. The online system works so smoothly and allows you to work at your own pace amidst all of life’s other commitments. Jaime’s guidance challenges and inspires each student, while also encouraging you to believe that you really CAN teach kids yoga. The thoughtful feedback received directly from Jaime at the end of the course during the certification process is wonderful. I feel so much more confident about leading my first classes now. I highly recommend Cosmic Kids! Jaime has developed a kids yoga program with a high level of knowledge, creativity, and great skill. With a wonderful focus on health and anatomy, along with asana, one is sure to feel prepared to teach kids yoga to children of all levels and abilities. Cosmic Kids is also a great addition for a classroom! I began doing Cosmic Kids yoga with my own children and was so inspired I knew this was something I wanted to teach professionally. The course was perfect for me as it is split into small, manageable chunks so as a busy working mum I could fit in the study to suit me. I loved the combination of study notes and videos as this really helped the information stick. There was so much help to develop my knowledge and performance skills. From being a complete beginner I was able to pass my assessment first time. Jamie even said I looked like an established teacher, all from the guidance in this course!The video feedback was wonderful and so positive. I will be starting a new business because of this training. Great course – enjoyed from start to finish. I was so pleased when I found this course as I could study in my own time and at my own pace. I found each section interesting and informative. It covers all the essentials as well as giving you helpful hints and tips. Covering class structure and why each part is important as well as class management and how to keep the kids engaged and motivated; anatomy, development and additional needs, which is important to understand what is happening in the body and mind as they are growing, helping to understand why kids do what they do. The postures are clearly demonstrated with commentary with how to instruct them, it was great to do the poses and have fun with them too. The guidance and support for working towards your assessment video is encouraging and helpful with lots of information on how to put it together. I thoroughly enjoyed this course and would highly recommend it. I am really looking forward to taking everything I have learned and start teaching. Thanks for a great experience! I thoroughly enjoyed this on line training course – and have only good things to say about it! Having trained in Baby Massage and Baby Yoga, kids Yoga felt like a natural progression, however, I learned so so much and Jaime’s enthusiasm is totally infectious, you can’t help but enjoy learning the postures and practising the “Squish the Fish” routine. My children also enjoyed me doing this course as they had fun being my little guinea pigs! Everything is in bite sized chunks and you can take things at your own pace. After I had completed the course and submitted my assessment video I received really detailed (and encouraging) feedback from Jaime, as well as my certification. I’m now in the process of setting up my own business, teaching in schools and nurseries, which is really exciting! Without question a five star course! I loved this course! Even though I have done yoga for years Jaime explains everything that you need to know it such detail, and in easy steps, that I could have done it without any experience. I work in a school and I practiced many times with Year 1 children and they loved it, they come up to me and suddenly get into a pose and tell me which one it is! 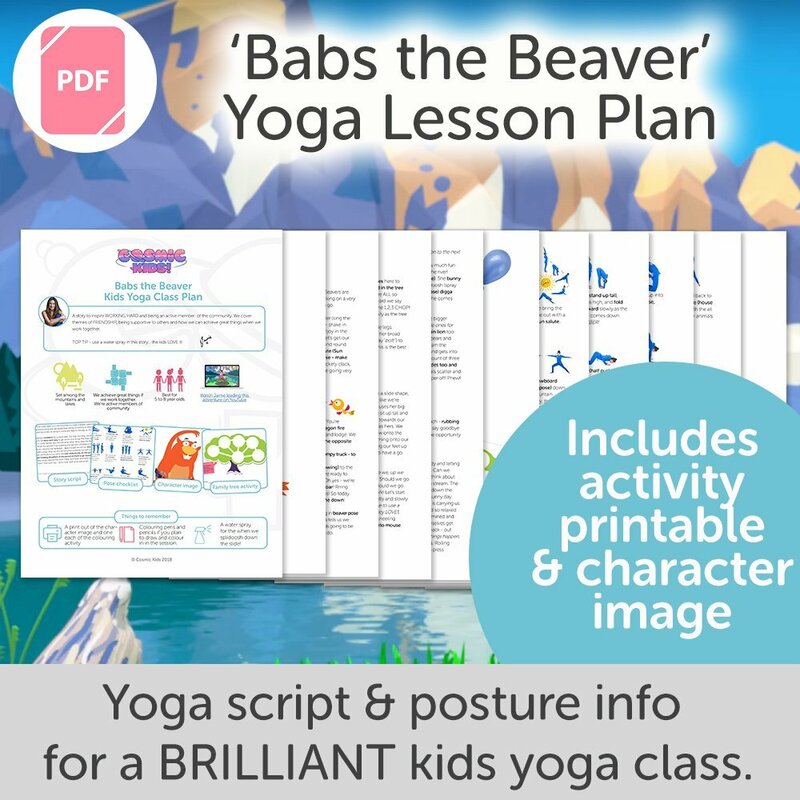 I now plan my own yoga stories using the topic that is being covered in class, which helps to embed their learning, and it really helps the children to remember things. I enjoy involving the children in the yoga too, they will often suggest a pose and will help If I can’t remember a pose. I am going to start offering this to older children in the school as it is so popular. Thank you Jaime for making this wonderful form of exercise/relaxation accessible to children. I was very pleased with Cosmic Kids and the way that yoga and mindfulness were being taught. I wanted to further my yoga instruction and signed up for Cosmic Kids training…which I am so glad I did. The material is descriptive and easy to follow. Jaime’s exuberance and love for her yoga career is very apparent and how she wants to share that knowledge is admirable. The material is downloadable and you can go back to review any piece of material or her videos when need be. Being part of a “community” is quite helpful since we get to share our experiences with our fellow yogi teachers. What impressed me the most that Jaime herself evaluated a video of you teaching a class and gave real honest feedback. I am so glad I partook in this program and have received my children’s yoga certification. Excellent! Thank you, Jamie, for such a great course. I love how your system is about teaching the whole child yoga. The postures are appropriate and well -described, and the depth of training was welcome for me. I look forward to teaching and sharing this with the kids in my area, and I hope to grow a love of yoga in them as well. What a wonderful, clear and concise course. It was easy to study and learn. Love the videos and all of the support materials. Thank you. I am so excited to be teaching kids yoga. Cosmic Kids has a great outline using the FLARE method. The anatomy was basic but thorough. Yoga poses come with a video and written instructions and there is a wonderful practice example video using squish the fish. I really liked how you added tips for getting the kids to follow. The information on how to handle kids who act out is very beneficial; as that is one of the things I had troubles with while teaching exercise. Thank you for the time and effort you put into making this a great program! Doing an online Kids yoga teacher training wasn’t in my plan because I think that learning to teach must have interaction. But I changed my mind when I watched Jaime’s Kids Yoga Crash Course. I was caught by her light and excitement about teaching kids yoga. Then I decided to give it a goal. Really enjoyed the videos and all material made available. Doing the assessment video was a bit tough but I got through it and for my surprise Jaime’s feedback was a life change experience for me. She just boosted my self confidence in a way that really made me getting in my shoes and going out there to find keen kids to teach. I’m very glad that Cosmic Kids exists and for the wonderful work they do, and also proud of myself for taking a step forward and doing the training plus the video. Now I’m a Cosmic Kids Yoga teacher! and can’t wait to share the stories with the lovely little souls out there. I highly recommend this course to anyone who is thinking about or even already teaching kids yoga. Jaime covers all of the basics that you would expect from a kids yoga course — e.g., anatomy, development, asana — but it’s her unique story-telling approach and unbridled enthusiasm and encouragement that really make this training truly spectacular. She also provides a number of pre-built class plans to help you get started. If you’re concerned that an online course versus an in-person course might not be personal enough, don’t worry. Jaime is extremely accessible and the Facebook support group is a tremendous blessing (because as a kids yoga teacher, you’re going to need it!). And it’s a LOT more affordable than an in-person training. 5 stars for sure! This course provides exactly what you need and what you need to know if you want to work as a kids yoga teacher. I have found it so useful, so valuable for my classes. It covers the main areas of knowledge and more!!! Jaime teaches clearly and hides no secrets at all. I feel I have the tools that will improve my teaching, making it safe and fun. During my classes, I frequently find situations I can easily solve by bringing to mind Jaime’s lessons. To tell you the truth, I think this course provides info that covers a lot more than the one you need to Get Started in Kids Yoga. And it is a lot of fun too!!! Thank you, Jaime!! Great course!If you love kids and yoga I recommend go for it! It’s easy to follow,very detailed and proffesionaly done. Squish video at the end is not problem at all. I had a lots of fun! Jamie your video’s were so enthusiastic and helpful. You have given me the guidance and confidence to start kids yoga and get my name out there. Watching your videos I felt as if you were physically in front of me explaining as much as you could for me to understand. I love how you broke down the sessions and gave examples on presenting the ‘drama’ of how to tell stories. I would definitely recommend you to anyone wanting to get into the kids yoga business. You are so easy to follow and understand and have great passion to teach everyone and anyone who wants to learn kids yoga! This course is amazing! It is of extremely high quality from both the adult and child education perspectives. The instructional material is thorough, relevant, and perfectly presented. The guidance is clear and detailed, and the learning process feels very personal and supportive. The product you are learning to provide is also of the highest quality. This children’s yoga program emphasizes the need and ability to incorporate social-emotional lessons and mindfulness skills, the physical components of yoga, and the story and performance to keep children engaged and learning. I couldn’t be more pleased with this course, and would highly recommend it to anyone interested in learning to teach children’s yoga. Jaime is a delight and so is this training program! Inspiring course! I enjoyed the course everything is very well explained and easy to follow. My 3 year old nephew and I had so much fun with Cosmic Kids Yoga videos while he was visiting. I ordered and sent him his own kids yoga mat and then decided to learn a little more about Cosmic Kids. I was so excited to learn about the Cosmic Kids Campus and the course for teaching kids yoga. First, I signed up for the free kids yoga crash course and loved it so much that I decided to take the full course and get certified. Jaime makes the course fun with her videos just like her kids yoga videos. Jaime sent me a lovely feedback video. Now, I can combine my love of yoga and teaching kids. Thanks! Amazing! This course was absolutely wonderful. The lessons were easy to follow and were full of more information than anyone could expect. I learned a lot from this course and am so excited that I am now a Cosmic Kids Yoga certified instructor. Jamie made it easy to learn and to then take what you learn an apply it in real life. My kids love all the adventures and meeting new characters. If you are questioning whether or not to give this a try, don’t hesitate. It was wonderful. This kids yoga teacher course was so thorough! I loved how it covered not only the basics of teaching a kids class but it gave specific details on anatomy, postures, development and performance to cater to a child’s needs. I loved going through the videos with Jaime to have a visual and audible reference of the material and then the large PDF manual to make my additional notes to reference back to again and again. In addition, the big book of postures with all of the corresponding videos of the postures will make it so easy to create my own sequences for teaching kids classes. I was also so pleasantly amazed of how thorough Jaime’s feedback was on my Squish video! I could tell that she really sat down and thoughtfully processed every aspect of my performance and gave wonderful critiques so that I can grow as a teacher! Wow! I cannot say enough about how well this course is put together. It is clear, concise, easy, and fun – every step of the way! I thought I would just get a sliver on teaching kids yoga, but this course gave me the whole package for jumping in head-on! I went from never even thinking about teaching children’s yoga, to teaching from 2 to 25 kids in just my first month – comfortably, and confidently, from ages 5 to 11. I have written my own classes and used “Squish The Fish” twice! I highly recommend this course to anyone wanting to change gears from teaching adults to children! Amazing! Incredible course. I am so happy I took the leap and just started! I am already a preschool teacher and I was using moves in my class, but this has taken me to a whole new level, and I have started teaching my own classes. Jaime sent me back such a helpful, detailed review of my video, that I was bursting with excitement. I have bought the business course because I am so confident that there is a need for kids yoga in my area. Thank you Jaime! Getting started in Kids Yoga Cosmic Kids yoga was a great learning experience and I would highly recommend this course to anyone who is interested in growing and expanding their kids yoga training and practice. I gained lots of tips, techniques and confidence in telling yoga stories for children in a playful, safe and interactive way. I am excited to continue and grow my yoga lessons with my students in my classroom and this course was such a great tool to help you get there. I absolutely had a blast doing this course, its just what I was looking for. I’m from a PE background and always looking for new and fun activities to do with kids. The units on performance and delivery were very useful and the course material is well rounded covering all aspects of anatomy, behaviour the postures and how to set them up etc. I have done quite a few courses over the past few months and this has by far been the most enjoyable, as well as informative. And the fact that there is a facebook group with lots of advice and info it allows you to see what is possible with this course. The icing on the cake for me was the really nice personal touch with the assessment feedback. recieveing feedback in a video aimed directly at me really wowed me! the feedback was brilliant and useful and basically just egged me on to get the ball rolling. So I have arranged a session in the nursery school, I hope to run kids yoga sucesfully from my fitness studio and make it one of my star classes that everyone wants to rush and sign their kids to. it is just really energizing I get a real enjoyment from it. I highly recommend the getting started in teaching kids yoga course. The material is engaging, easy to follow and taught in several different ways to really embed the knowledge. Jaime’s performance tips and her style of teaching kids yoga is very engaging. She breaks it all down really well, this really gave me the confidence to find my inner performer and have fun with the teaching! The course teaches very adequate theory on child development and the body’s systems. I feel able to teach kids yoga safely and creatively. The fact the course gives lifelong access is amazing, I know I can check back whenever I need reminders on how to instruct the poses. The cosmic kids platform offers lots of resources like lesson plans for after the course. Jaime has always answered any communication from me quickly and informatively. Her feedback on my assessment session was very thorough and insightful. I really cannot recommend this course enough. I’ve done a lot of fitness programs… and I mean… a lot. It’s not that they’re bad… But there is only so much information you can retain in dry reading a 400 page manual, or practicing postures etc. Some have had OK qualities, like watching them teach the online program to other people. But this, this takes it to the next level. Jaime speaks to you “face to face” so to speak. She is talking to you, not to a class that you are overseeing from the background. Maybe it’s just my weird personality, but I enjoy looking people in the face while they are speaking to me, and what’s even better yet, Jaime just has a friendly, easy to listen to voice that doesn’t make you want to scratch your ears off! I highly recommend this program, my kids are loving practicing with me, and I am retaining nearly everything thus far!!! This was my first experience doing kids yoga. I didn’t even know it was a thing but this course was amazing!!! I truly enjoyed all parts and thought it was really well done. Jamie has done a beautiful job creating something that is easily accessible for all to be able to achieve their goals pertaining to kids yoga. I also really appreciated her video feed back of the completion of the course. It’s nice to know that she actually takes the time to watch and critique your performance to help you improve! I highly recommend this course!!! This course was absolutely amazing! You really learn a lot from Jamie and Martin. I was so excited to take the course and it went above and beyond my expectations! It’s fun, informative, and can be done on your own time for as long as you need to complete it. This course is perfect for busy people who don’t have weeks or weekends to send in children’s yoga teacher training. I am a yoga teacher, and certified in a few different kids certifications, and Cosmic kids has been so much fun!! I have brought much of what I have been learning into quite of few of my classes recently and even my older teen students love the stories!!! I have decided taking this course after seing how much my little girl likes the videos uploaded by Jaime on YouTube and I was expecting some minimal, play like information about some yoga poses. But when I saw the course Dashboard I said: WOW! This is serious, professional information! The yoga poses are saved for last because there is so much more to be informed about before getting started that you wouldn’t think of : anatomy, child phisical and psichologycal development, tips and tricks on how to get and keep children’s attention, and so on. All in all, this course offers more than you would expect and I definitelly reccomend it to everybody from parents to teachers. I have been an adult yoga teacher since 2011 and occasionally taught a kids yoga class but since having children and moving to a new town, now felt the right time to learn to teach kids yoga properly and to try adding it to my teaching schedule. As much as I would have loved to go on a person to person teaching course, at the moment with two little people and no full time job I couldn’t quite find the money or the intensive time. I felt a little guilty about this until I found Cosmic Kids!! After watching Jamie’s intro video course and a few Cosmic Kids youtube videos I thought maybe at this moment this was exactly what I was looking for… and it was and more!!!! The course is not only filled with amazing content but has been so brilliantly put together, that I don’t believe you could gain much more from a personal course. It is so easy to follow and access and is a positive, engaging experience from start to finish (kind of what you hope for with a kids yoga course). Jamie is so encouraging, especially as I have to say even having taught over 600 yoga classes, I was still really nervous at delving into what felt a whole new world of yoga (and a pretty important one)…kids yoga! This course has all the tools and inspiration you need and with the added extras of the Facebook group, youtube channel and download sheets, class plans etc. I feel so well equipped to tackle my first official kids yoga class next week (eek!). I really feel part of something much bigger having done some training with Cosmic Kids and that is really important especially in yoga, which I think can sometimes can feel a little solitary as a job. 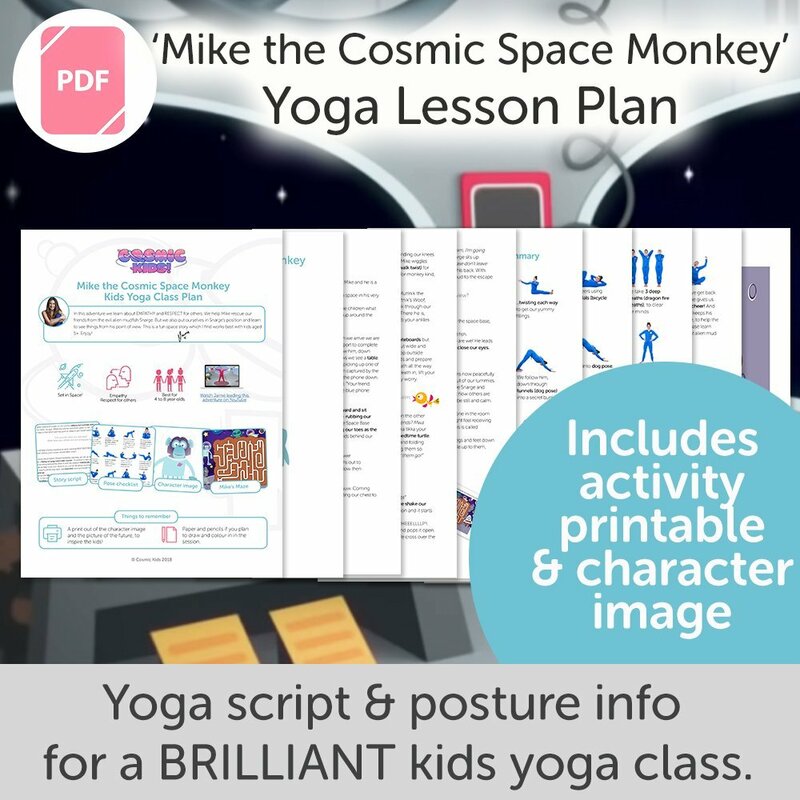 I cant recommend this course enough if you want to get into teaching kids yoga and want to feel you have the tools to make it more fun for everyone involved or even if you just want to add to your home fun, my 3yr old has since fallen in love with the Cosmic Kids youtube channel and I somehow don’t feel as guilty having him infront of a tv screen (especially during the winter months) if he is doing yoga whilst watching it. I do my class plans whilst he follows along, its pretty awesome to watch. Im so glad I found Cosmic Kids! Excellent Training and Resource. I am a 200 hr certified Yoga teacher and decided to complete this training to start teaching children, including my own. It has been a valuable experience giving me the resources and confidence to start kids classes. I still find myself turning back to Jaime’s descriptions of poses to gain enthusiasm and instruction. I worked hard to practice throughout my training, and at the course completion, Jaime provided thoughtful and helpful feedback. The Cosmic Kids Facebook group is also a wonderful resource. Overall this course was just lovely to watch and learn about. I own a practice called Dragonfly Pediatric Therapy and it has come to my attention that kids yoga would be a perfect addition. I’ve completed the course, I just have to practice and turn my video in and let the teaching begin! Update: I got my certification today along with a delightful feedback video from Jaime herself. She is such a lovely person, y’all! Take this course, you won’t regret it!!! Covers similar material to much more expensive, onsite training courses, but with the convenience of being able to study and practice in your own time. With the CK Campus Facebook group, you don’t feel like you miss out on peer support and there are so many CK adventures online, plus class plans, games, and other resources, that you’ll never be stuck for ideas for a session! I thought this course would be a good starting point to begin my kids yoga journey – I didn’t expect to finish the course feeling so well prepared – ready to hit the ground running! I loveee your teaching program, it is so expressive and perfectly designed! be able some day to introduce yoga to children. I wish I was introduced to it when I was little. I love yoga and through your course I discovered the fun of it! Can’ t wait to speak to you! As a homeschooling mom of four wonderful children (under 6), this training gave me the flexibility I needed to fulfill a life long dream. I have always wanted to become kids yoga certified, but never had the time or money to get it done. The Cosmic Kids Yoga training was convienient in its’ schedule, reader friendly, easy to understand, and fun to do! My very own kids are huge Cosmic Kids fans and I can attest that Jaime’s yoga stories truly engage children while melting away any stress they may carry. Finding Cosmic Kids, and in turn this training, has absolutely been a blessing. I can’t thank you enough Jaime! Namaste!! Just what it says-getting started in kids yoga! Very helpful! Videos were so engaging and fun too! THE course deserves 7 stars not only 5. It’s very complete, enjoyable, easy to follow and I really liked going through it . But the best part for me is the time Jaime dedicated to analyze my squish the fish video, giving all suggestions needed and encouraging and giving helpful advise. Jaime you made me feel very important and I didn’t expect to get all this time from you. Thanks again. I have already used a few stories for my own yoga courses to kids and they work great! I’ m thankful and grateful and honored to be part of this campus , news are always coming up, new stories, new ideas, well, everybody should give a try to this course! I honestly can’t say enough good things about this program. It gave me a thorough understanding of how to teach kids in a fun, engaging and safe way. As a result of taking this program I landed a regular gig at my son’s school teaching a weekly yoga program. And having gone through the program I am able to teach with confidence knowing that I am introducing the kids to yoga in a really safe way. And the support from Jaime was phenomenal. My only wish is that there would be another level of the program because I want to keep learning from Cosmic Kids. I loved doing this course. It was fun, informative and has given me the confidence to teach yoga to children. Jaime is great and supportive and out to bring yoga to children in a fun and engaing way. Do it! I am so grateful to have found Cosmic Kids Campus! Being able to get certified online made it possible for me complete the course at my own pace. As a high school teacher, I can appreciate Jaime’s teaching style and way of delivering information. The modules are broken down in a way that makes learning simple and fun. After completing the course, I feel confident teaching yoga to kids and feel that I have found a supportive community of other kids yoga teachers through the FB Page. Jaime’s personal video feedback at the end of the course was thoughtful, encouraging, and helpful! If you are considering getting certified in teaching kids yoga, this is the way to do it! This is a great kids yoga course for anyone wanting to teach kids yoga. I was a little hesitant in doing an online kids certification, but I let my 4 year old boy have a great influence on this decision and I’m so grateful I did! My yoga background is I’m a RYT-200 that has extensive training in aerial yoga which is primarily what I teach every week. We used to have a kids yoga program that was certified through Yoga Alliance at our studio which I’ve taken my son to, and I honestly didn’t care for it very much. I knew there had to be better programs out there. A fellow yogi told me about Cosmic Kids Yoga on YouTube, and from the first lesson (Star Wars in our case), we were hooked. He was engaged from beginning to end. So, my next step was testing it out on his friends (little boys who had never heard of yoga)! They loved it just as much. My mommy friends were impressed. I didn’t know where Jamie got her training so I just went online to search for her website so maybe I could ask. That’s where I found the Cosmic Kids Campus teacher training. I was still hesitant as it was online, so I emailed Jamie and Martin with some questions about the program. Within a day, I had an email back with answers to my specific questions from Jamie herself, not just a generic auto reply. This was a high quality program including much information on kids anatomy, physiology, stages of development, asanas, developing a class, performance, etc. I was impressed! Jamie and Martin are also very responsive when questions arise. There’s also a Facebook group where teachers post classes and ideas so you’re part of a kids yoga teacher community. Once I learned my "Squish the Fish" class that I submitted as a final exam, I received a video back from Jamie with loads of feedback. I am very grateful for this training, as now I can help introduce yoga to our next generation in a manner that will hopefully be fun and enjoyable for all the kiddos in my community. Namaste. It is a very well designed course to teach kids yoga. Easy to learn and understand and I had a lot of fun to complete.